Workforce WindsorEssex is the region’s Local Employment Planning Council. Our mandate is to plan, facilitate, and advocate for regional workforce development, defined as the development, retention, and recruitment of a wide range of skilled workers to meet the current and future economic and social development needs of Windsor-Essex. The Ministry of Training, Colleges and Universities provides funding support to Workforce WindsorEssex to undertake various workforce planning projects, including the collection of Labour Market Information. This guide provides an overview of the information available from Workforce WindsorEssex and how it can be used to support various community, business, and educational initiatives. As you go through this guide you will learn about the types of information that Workforce WindsorEssex has available to you for free and the many ways you can use this information. Whether you are exploring careers in our region, are looking for ways to improve your services in the community, are wanting to compare your wages to other companies, are working to improve the economy of our area, labour market information is a great place to start. Labour market information (LMI) is any data related to employment and the workforce. Whether it’s demographics statistics, industry trends, wage data, or any of the wealth of employment information that is available, this information can help you make informed decisions that fit your needs. You can find LMI through Statistics Canada, the Job Bank, and of course, Workforce WindsorEssex. 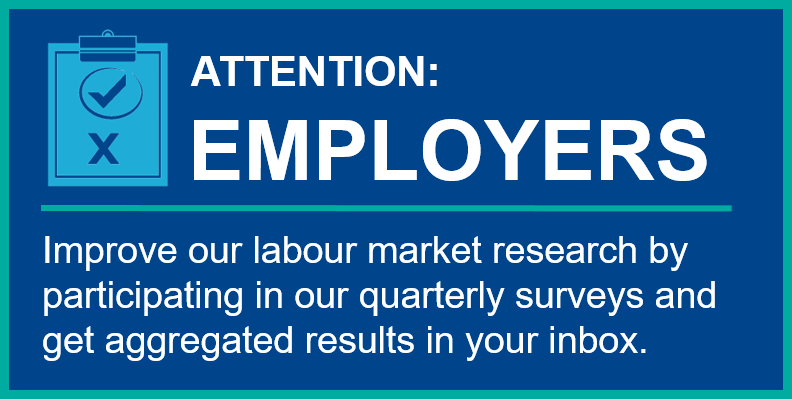 Our labour market information page offers a variety of data resources that you can use. This user guide will walk you through how you can use those resources and additional resources that can be found on our website. How can you use LMI? LMI is an integral part of exploring career opportunities. We’ve compiled the following list of resources that you can use when incorporating labour market information into your career exploration process. When thinking about a future career, we tend to also think about the kind of lifestyle that career will provide us. Wages can be an important part of a person’s lifestyle. To make sure that your expectations of a job are realistic it is important to see what people in that job are making locally. Looking at the median wage and 10th, 25th, 75th, and 90th percentile for wages will let you know how much you are likely to make when you first enter the field as well as after you have had many years of experience in the role. This information can help to solidify your career decisions or may steer you in a different direction based on your lifestyle goals. If you find yourself struggling to locate specific employment related services, or are just looking to learn more about what services and supports are available to jobseekers in Windsor-Essex, WEsearch can help. By answering a few simple questions, you can find services that fit your needs. This tool has information on employment supports for different groups, including youth, newcomers, and persons with disabilities. It also has links so that you can quickly find labour market information on the top jobs in our area and those requiring completion of an apprenticeship. If you’re having difficulty knowing where you can access services and information, WEsearch can give you some direction. Part of deciding on a career path involves understanding the training that is necessary for the industry you are interested in. For some fields, such as health care, the required education is standard and mandatory for almost all roles. However, for some industries, such as manufacturing, there can be a lot of variety in what training is required and where you can get it. When deciding whether or not to complete training that isn’t mandatory, it can be helpful to know what education others have completed. Looking at the educational attainment for the region will show you what certification level many people have and help you decide what level is best suited for your career path. Taking a look at the regional educational attainment and its impact on a person’s income level may also lead you towards a certain educational path. Once you have narrowed down your future career possibilities, you may be unsure of how to get there. Looking at the potential career pathway of that job in WEexplore can be beneficial in showing you multiple positions that could be starting points for your career goal. For example, you may have an interest in becoming an industry consultant for the manufacturing industry. Through mapping this career out on WEexplore, you realize that a marketing background would be a beneficial part of this career path. you can see, there are many possibilities for what your career path could look like. This information will let you see all of these options and provide more information on what it takes to be successful in that position. Knowing what is happening in different industries can help you make more informed career decisions. Being aware of new long-term projects that need hundreds of workers, policy changes that hinder success of an industry locally, or skills shortages in a field that you are interested in can give you a new perspective on what your career could look like. For instance, a skills shortage may be beneficial to you if you have skills that are greatly in demand. It is also important to know about the types of jobs that exist in different industries. For example, you may have developed a skill set in technology, but also have a keen interest in agriculture. Researching the types of jobs that are available in local industries will help you discover if there is a career that combines those two areas of interest. If you are interested in viewing information on local job opportunities you can sign up for WEjobs. WEjobs is an email service that delivers information on new job postings, career fairs and short-term training opportunities a couple of times per week. You can also explore our LMI in the News page to see local articles on what is impacting our labour market. It is important that you compare local headlines to data to make sure that the local labour market characteristics are accurately being reflected in the media. As a job seeker it can be helpful to know what local employers are looking for, including what jobs they are struggling to fill and what skills they expect from their job candidates. This information and more can be found in our Quarterly Employer Bulletins. These bulletins highlight results that are compiled from local employer survey responses, providing the answers to questions like “How many of your hires were youth?” and “Which positions did you hire the most employees for in the last 3 months?”. Having up-to-date information on our region will help give you further insight into what jobs are available locally and how you can stand out to employers. At Karn Academy, a local K-12 school, students in grade 11 are counselled on what careers they should enter. One of the students, Corey, is struggling to decide if he should be a Lab Technician or a CNC Machinist. When making this decision, he compares both jobs’ median wages, whether the job is in-demand, and the schooling required for each. After viewing Workforce WindsorEssex’s Windsor-Essex Wages page, he learns that a Lab Technician makes a median wage of $32.46/hr and CNC Machinists make a median wage of $23.21/hr. After looking the Quarterly Employer Bulletin, he sees that CNC Machinists are in-demand but Lab Technicians are not. Corey takes part in Manufacturing Day tours with his class and finds that he really enjoys learning more about the role of a CNC Machinist. This job uses many of the skill sets that he is hoping his future career will require. He then uses WEexplore’s career profiles to learn about the schooling that is offered locally for each of the jobs and finds that he can complete an apprenticeship and in-class requirements locally to become a CNC Machinist but he would have to move away for school to become a Lab Technician. While Lab Technician’s make higher wages locally, Corey feels he is likely to secure long-term employment as a CNC Machinist by completing his apprenticeship. He is excited to start his career and has registered as an Ontario Youth Apprentice. LMI can be the source of information you need to support your business planning and grant writing processes. You may find the following types of LMI helpful for the next time you need to provide evidence for the types of work you’d like to implement and pursue. If you are interested in learning more about where employment opportunities are in relation to public transit routes, you may find WEmap to be a helpful tool. This tool shows, on a map of Windsor-Essex, where new job postings are as well as where City of Windsor Transit routes are located. Using this tool will help you view available jobs in proximity to where public transportation travels, which is particularly useful when working with job seekers who rely on the public transportation system. When creating projects that will serve the needs of the community, it may be hard to know what the community needs. For new organizations, or those that want to extend their reach, reviewing labour market information in the news can give you clues as to what is most important to the community and what issues are having the greatest impact. While you may be overwhelmed by the amount of news that is produced each day, Workforce WindsorEssex curates a list of news that showcases issues, announcements, and initiatives that affect the local labour market and our workforce. It’s important to compare local headlines to data sets to ensure that these two sources of information line up appropriately. When serving a community, it is important to learn the statistical data about the demographics of the people who live there. This can be done by reviewing labour market information, such as population differences between genders, and the age of residents. This information can be used in a variety of ways when planning for future programming that is responsive to the community’s needs. For example, in creating a new training program, a look at the age breakdown of the community may lead you to decide to target your program to older workers who would still like to be part of the local workforce. Migration data helps users to understand how people leaving and coming into our community has impacted our population. There are charts available that show the age break down of in-migrants and out-migrants. Additionally, there is information available on where residents are migrating to when they leave our community, and where they are coming from when they move to our community. While migration trends may seem more valuable for those working in high level immigration positions, it is also incredibly important for those working on the ground level with newcomers in Canada and our region. The large influx of newcomers that Windsor-Essex has received in the last few years has impacted our community in many ways. With the increasing diversity of our community comes the considerations of language barriers, childcare needs, and work experience recognition. Knowing how many immigrants are present in our community and where they have come from will help us to better serve them through their settlement process and make their transition more successful. A review of locally paid wages will not only tell you what people are earning in their jobs, but it can shed a light on the income level for specific populations. For instance, if you serve a community where many of the people work in a low paying occupation, it is likely that many of the people in that group are struggling with their expenses and may be living in poverty. While larger data sets can show the specific income level of the community and of particular demographic groups, looking at groups of workers may give you more information on how to serve that population. For those working in employment services, education, or poverty reduction, information on the educational attainment of our region and its communities could be helpful to you in your job. For those working in employment services, being aware of what the most prevalent education level of the community is can help you to better prepare your clients for the competitive and high-skill demanding job market. For those in education, understanding the educational attainment of the community can help you to better support your students. If you find that your community has a high amount of residents with less than a secondary school diploma, you might see a need for an adult education program at the secondary level. If you find that there is a high rate of students completing graduate degrees but very few completing apprenticeship certifications, you might consider highlighting a broader range of career possibilities with your students, highlighting a need in the skilled trades due to a lack of certifications. For those working in poverty reduction, it would be helpful for you to know the educational attainment of the region in order to decipher whether low education levels are a contributor to the poverty issue, and which designated group would benefit the most from upgrading their education. Depending on your organization’s goals, it may be beneficial to look at what occupations most people are in and which occupations and industries are most in need of workers. Reviewing industry trends will also provide insight into which occupations and sectors may be facing a decline or growth in the future. It is also helpful to understand the industries that people are employed in that may be unexpected. An example of this would be individuals working in health care related positions in the manufacturing industry Knowing the various demands across sectors will help to ensure that clients receiving employment supports, students seeking new training, and career changers are aware of what is happening in all sectors in Windsor-Essex. Quarterly Employer Bulletins provide a look at what is currently happening for businesses in our region. These bulletins are created using results from surveys that local employers have completed. Each bulletin highlights the hiring needs of a wide variety of employers, as well as workforce separations, including retirements, dismissals, and quits. It identifies the top skills that employers are looking for in their candidates and which positions they are struggling to hire for. Reviewing the Quarterly Bulletins will provide an overview of all this information so that your organization can have an up-to-date view on businesses in Windsor-Essex. Morris Employment, an employment organization located in Leamington, is providing a course on job readiness for their clients. The program is currently being marketed towards older workers, specifically those 65 and older that are looking to re-enter the job market. All of their promotional materials are in Thai and Polish as they had thought these languages were commonly spoken in the region. However, they are getting very low attendance for these courses and they aren’t sure why. When reaching out to Workforce WindsorEssex about ways to improve their marketing to this population, they are informed that the most common languages spoken in Leamington are English, German, and Spanish, while Thai and Polish are the 7th and 14th most popular languages spoken. Morris Employment decides they will gain a broader audience by distributing materials in these additional languages. By examining the demographics of the municipality they also learn that if they open up their course to those aged 50 and over, they are opening up the course to 40% of the Leamington population instead of just 20% with those aged 65 and older. Making these changes has greatly improved the participation of their job readiness training course. Labour Market Information can help to shed light on your own workplace practices or those of an employer that you may be working with. The following resources and data tables may be a good place to start as you consider the types of labour market information that may be valuable to your workplace. Whether you are looking to compare your hiring practices to other companies or are looking for an overview of what positions businesses are struggling to find candidates for, checking out the Quarterly Employer Bulletins can help. These bulletins are based on results from surveys that local employers have completed. Hard to fill positions are highlighted in these bulletins, which may be beneficial to know when looking at the labour supply. Through the bulletins you can also learn about the types of skills that local job seekers have. When creating a succession plan for your company or creating an initiative for skilled workers in the region, the Quarterly Employer Bulletins help you have a pulse on what is happening in the community. Demographics data includes any information related to the population and the groups within it. This includes information on the population’s age, gender, income, dwellings, ethnicity, religion, language, and employment. This data can be used in a variety of ways to plan your workforce. For example, you may want to make sure your workforce reflects the diversity of the community. This information will help you explore exactly what the characteristics of people in your community are. Or, you may find many people in the community speak a language other than English or French, so you plan to hire someone who also speaks that language to increase accessibility and ease of access for customers. We all know how important wages can be for attracting and retaining great employees. When considering what to offer a new employee or the right amount for a raise, it is useful to know what businesses in the industry are paying. Workforce WindsorEssex can provide you with 10th, 25th, median, 75th, and 90th percentile local wage data to help you make compensation decisions. Do you know how many people are graduating from a program you pull candidates from? Is an occupation you’re hiring for considered “hard-to-fill”? Is the industry’s workforce projected to grow or shrink in the future? Do you need someone with a post-secondary education? Questions like these can help you prepare to hire from the available labour force, since knowing whether the labour force is able to meet your workforce needs and understanding the current state of the industry can help you adapt your hiring strategies and training programs. When new companies are looking at moving to our region they may be wondering what education level is most prevalent of those available in the labour force. Looking at the educational attainment levels in the region will show this for the current period and over time. For companies that are looking for highly skilled workers, there may be a need to upskill those in the labour supply. If the company is hiring for entry-level positions requiring a secondary school diploma, they would want to see that the majority of jobseekers have a secondary school diploma or higher as their highest level of certification. DataBricks has been having a hard time finding a senior web developer and isn’t quite sure why. DataBricks knows Workforce WindsorEssex might be able to provide some insight, so they get in touch. Workforce WindsorEssex finds that 40 students graduated from the local web development program in the last year, and during that same time period there were 45 job postings for web developers.. Additionally, there were only 147 people working as web developers in Windsor-Essex in 2016. Evidently, there is fierce competition for web developers as there is a small supply of them locally, and most are likely junior developers. Using this information, DataBricks realizes it should look outside the region for talent and that it will likely need to pay more for a senior developer. Additionally, it commits to starting a rigorous training program for its current developers to move them into senior positions more quickly. Using LMI can be an effective strategy when exploring careers, supporting your mission, and planning your workforce. Knowing what LMI is available in your region is the first step. Need more help when using LMI? Contact Workforce WindsorEssex at info@workforcewindsoresex.com or 226-674-3220.